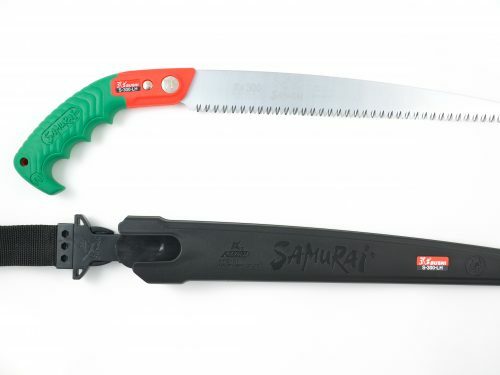 Samurai Saws UK Ltd specialises in providing high-quality pruning tools made from premium SK-5 steel that rival any competitor for both the professional arborist and domestic market. 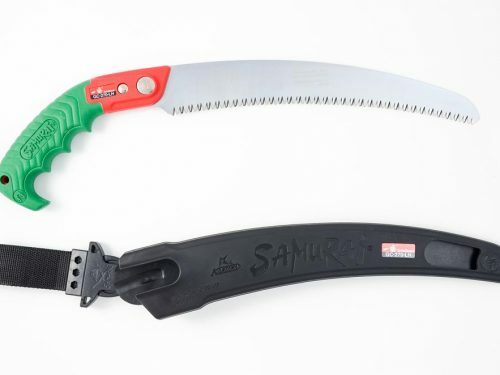 Samurai Saws UK is a young family business that grew from a need to source alternative high-quality pruning tools to those we used at the time. We discovered Samurai saws in 2007, used them and were hooked. Excellent quality at an outstanding working price. When we could no longer get them easily we started on the journey that leads to today becoming the UK distributor in 2016! That is how much we believe in these products. The saws themselves are manufactured in Miki City, Japan. This is a place whose history of hardware manufacture stems back around 1,500 years with its origins in ancient Japanese blacksmithing. Miki is one of the oldest towns of blacksmiths. It was the reconstruction of the city in the late 16th century after a victory by a famed Samurai warrior, Toyotomi Hideyoshi, in a war with a local Lord that established it as a hardware manufacturing town. Tradesmen who travelled from Miki took their tools with them, they gained a good reputation and demand for Miki hardware grew. Combining traditional craft and modern technology Miki City today is not only the leading hardware manufacturing city in Japan but also known worldwide for quality and craftsmanship and producing world-renowned tools. Samurais Saws come from this base and reflect the very essence of Japan – the blending of ancient tradition with current engineering expertise. Kanzawa Sieko produces an outstanding range of precision pruning tools. The saws are manufactured utilising the latest technology to produce a razor sharp, taper ground, durable, impulse hardened blade that lasts up to three times longer than conventional blades. The Kanzawa patented teeth design on the GC curved saws ensures uniform cutting along the blade to ensure a more efficient cutting action. Coupled with a finer taper ground blade to reduce resistance this makes the GC series probably the most efficient, fastest cutting pruning saw in the world. This design is unique to Samurai. The soft, ergonomic, pistol grip handles are second to none in terms of comfort, function and security. Here at Samurai Saws UK Ltd, we supply high-quality tools at affordable prices. With a base firmly in the practical arborist industry, we know the equipment is necessary yet can be costly. With Samurai Saws the arborist can have a reliable product at an affordable price without compromising on quality. This is a fantastic saw, light and very sharp. The grip is just right and the blade goes through the wood with ease. I cut through 3″ diameter green Dogwood branches with a few effortless strokes. The curved blade keeps the teeth in contact with the wood and it’s slim enough to be used in tight spots, unlike my clumsy bow saw. No need to spend £60+ on a saw, just get one of these! 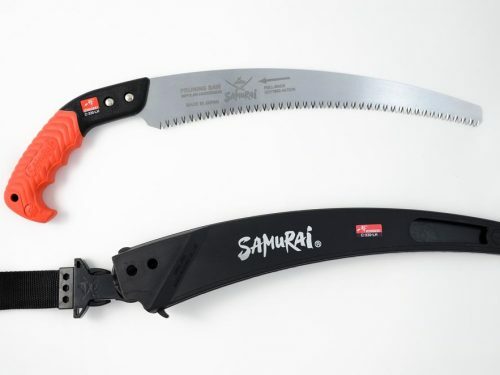 Great value saw, I usually use other Japanese pruning saws but I won’t anymore. You will not be disappointed, It cuts as good as anything If not better than what I have used before. This is an excellent saw. I bought one of these saws 6 months ago. I am a professional tree surgeon and use it every day – the quality is unbelievable. I have just bought a new one – will definitely use all the time. After a couple of weeks use on orchard trees with branches up to 150mm diameter, I can confirm the saw cuts clean and fast with little effort & without the teeth getting clogged up with sap or sawdust. As good as other Japanese pruning saws and at a better price. A great saw! This is an excellent product, highly recommend it whether you’re a professional or domestic user. Best pruning saw ever. You will not find a better pruning saw than this, cuts easily with no effort and is a quality made product. Great saw, does exactly what you want from a pruning saw with clean cut, well-made bit of kit. Brilliant saw used it for 3 and 4 ” limbs cut through like butter no clogging. Brilliant, wish I’d ordered one of these years ago.